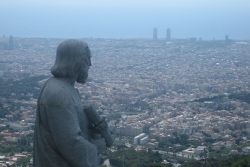 This wonderful church looks over the city of Barcelona from up high on Tibidabo Mountain. Its night-time illumination provides a hauntingly beautiful backdrop to those districts of Barcelona which are lucky enough to have it in full view. Relatively new in terms of the grand historical religious buildings Barcelona has to offer,the Temple Expitatori del Sagrat Cor went under construction in 1902 and was later completed in 1961. 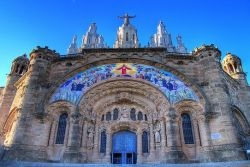 Crowned with a huge bronze statue of Jesus, the sacred heart is one of Barcelona’s most recognisable landmarks and a paying it a visit also provides truly fantastic panoramic views of the city below. Elevator to the top: 2€. The Tibidabo Mountain is one of the natural sightseeing points in Barcelona and also hosts a theme park that was inaugurated in 1901. Take a ride on one of the hair-raising roller coasters and mix of high-tech and old-fashioned attractions, such as the old red plane which is a replica of the plane originally used for the first trip from Barcelona to Madrid and marvel at the view of the city. The Tramvia Blau (blue tram) and the Funicular Railway were brought into operation as public transport to access Tibidabo and are probably the most enjoyable options for reaching the top of the mountain. 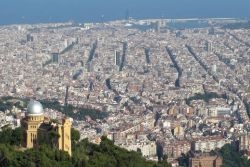 From the summit of Tibidabo Mountain the breathtaking views over the city of Barcelona are really impressive, especially at sunset. 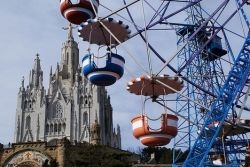 There are several options to get to the top of the Tibidabo Mountain by public transport. 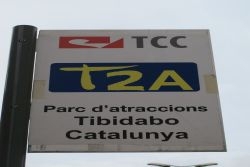 From the city centre you can take the direct bus or Tibibus from Plaça Catalunya (T2A). The bus stop is located at the upper side of the square on the corner with Rambla Catalunya. The frequency is every 20 minutes. Single ticket: 2.95€. If you are coming from another district, buses or the Ferrocarril railway FGC (Tibidabo stop) will take you to the Plaça Kennedy in the Sarrià Sant Gervasi district and from there you can continue your trip by tram (Tranvia Blau) or bus (196). Be aware that neither of these options will take you right to the top of the Tibidabo Mountain, so you will need to take the funicular railway to continue your trip. You can use your T10 ticket on the funicular railway, but for the Tranvia Blau you will need to buy a separate ticket (4€ one way ticket). Check timetables here.